Yet another hazy, warm, still day. Almost 15°C at one point. I’m writing this at 23.30 here, it is still 10°C! The new guys on the advance party are giving me grief for telling them to bring gloves, thermals and warm hats. The streams are gushing off the Tundra and snow melting fast. The river continues to rise and has a touch of dirt in it. Up to 2°C this afternoon. I would expect (hope!) it to level off in the next 24 hours and then start a steady fall; we could do without any rain. The change in a week is noticeable up here. On Monday one Pied Wagtail arrived in camp, yesterday three others arrived. They have restored themselves feasting on the enormous stone fly hatches. We saw our first Arctic Tern yesterday, and of course the Mergansers have arrived in preparation for the prolific smolt run that will start any day now. The Ravens that nest opposite the Lower Camp arrived this morning and made a tremendous racket. We saw the Fish Eagles yesterday at Middle and a mass of waders and ducks along the banks, all heading North. The whole place is waking up fast. 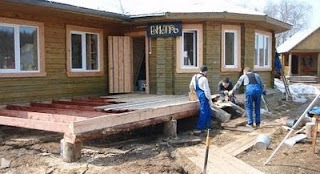 Meanwhile the rush to get things done continues; the building crew insist on playing Russian disco music at 1,000 decibels, while wielding chain saws and drills – we all have headaches. I was quite envious of Donna, Garth and Dave who went back up to the peace of Middle today to continue preparations there. Not much to report on the fishing front I’m afraid, we have had our heads down. If I had had a chance it would have been a fast or very fast sinking tip and a biggish fly. I’m going to Murmansk tomorrow afternoon (Friday), then to UK on Saturday. Charlie White is coming up on Saturday with the first team. Between us we’ll try and keep you updated until he has his feet ‘on the bank’ here. The news can then turn to more ‘fishy stuff’ as we start getting into serious fishing. Honour was partly restored last night, the sun came out for an hour or so and Jessie popped down to the Heli Pool and landed our first fish. Not huge it must be said, as the Russians constantly reminded us (theirs was indeed a cracking 12lber), but a fish all the same and quite correctly celebrated with Vodka. The fog has gone and we had a bright, warm day today. 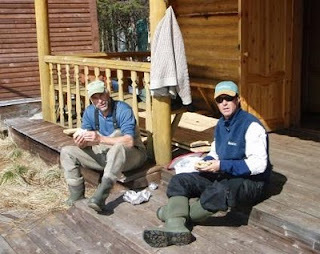 About 10°C, possibly more – we were working in shirt sleeves at times. The river rose another few inches over night, and this evening has really come up and is now pretty high. I suspect it will not drop off that fast and with the water temp likely to be in the range 1°C – 4°C next week it will be proper high water spring fishing, and good conditions for us. 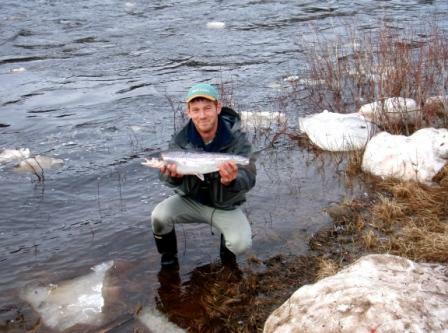 The fish will be really concentrated and we have had some of our best catches when the river is like this. If you are coming next week make sure you have a line that can get down. A fast sinking tip or even a Teeny Line (I use a Teeny 300). If you need advice and/or kit quickly, call Brian Fratel at Farlows (020 7484 1000), Brian has fished with us on this week for 14 years and will give you excellent advice and can provide the kit. Dave (on the left) our mechanic and Garth the Middle Manager (on the right) and I went up to Middle today. Big Misha and Volva were there with a team getting the camp looking ship shape. Luda was in the kitchen keeping us all going. There is quite a lot of ice on some banks, but much is clear and several places looked really inviting – Beach, Snake Pit and parts of Fortress. We took the boat all the way up to Clarkes Corner to have look. Clarkes is clear of ice and looked wonderfully fishable, opposite is quite a wall of ice, the sun was out and the scene was pure magic. It is still foggy, windless and surprisingly warm. The air temp today is around 10°C, which is considered pretty balmy for mid May up here. There is still quite a melt going on and the river has come up some 6” or so in 24 hours, ice is now being moved off the banks and it is definitely not a day for wading – another deterrent is a water temp of 1°C. The first week is going to see high, cold water – nothing new but a reminder to those coming on Saturday. A rise like this is welcomed, it helps to clear the banks before we start fishing in earnest in five days time. 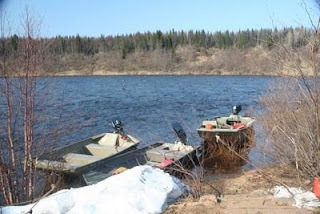 Garth and Jesse gave it a go for an hour in the deep pot where we park the boats at the start of the season. They both lost fish and had a sea-trout on medium sink rate tips and 1 ½" brass tubes. The Russians offered us some of their salmon soup and the use of a large Toby – the former we accepted, the latter we regretfully declined. Today we have not had a chance, but I guess might give it a go after supper if the air temp stays up. Work here in the Lower Camp continues apace. The main lodge new floor is finished as are the ceilings and walls. New windows are going in today. 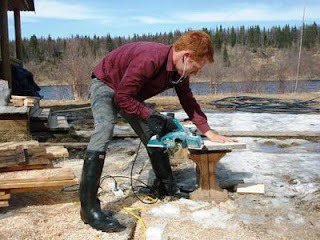 We now have two bore holes – so no frozen pipes down to the river, and a new electricity supply. 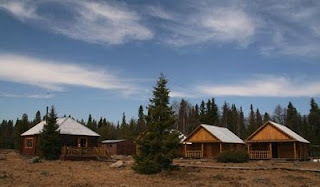 Tomorrow we will take a boat up to Middle Camp. 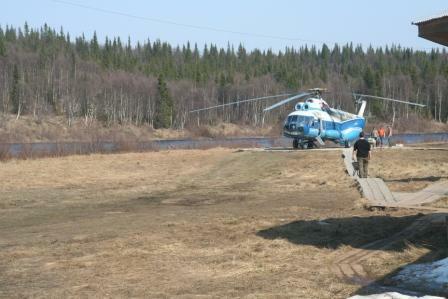 Big Misha is already there with the usual crew and first reports are that the camp is in good order (we might sneak a rod in and see if we can report on Bear Pool).